Each season the NFL brings us some highs and lows and as usual it’s the fans of their respective teams that ends up asking questions and simply looking for answers as to what went wrong. As an avid New England Patriots’ fan I saw the team rise to unparalleled heights by posting the best record in the NFL last season only to flame out like a damp squib in their postseason loss in the divisional rounds of the playoffs to the New York Jets . I’ve longed maintained that Patriots’ coach Bill Belichick can be conceited and complacent and clearly once again this pretty much summed up the season for the Patriots . Now for me the one team I’ve looked at from afar and wondered how it is that from season to season their fate never really seems to change . And for me that team is the Detroit Lions coached by Jim Schwartz and an experienced team of assistants . You could say that the curse of Matt Millen has essentially led the Lions to where they’re now at a team said to be heading in no direction in particular. Millen’s tenure as GM of the Lions can be best described as an unmitigated disaster and a complete mess because he simply didn’t know how to assess talent much less get the best out the players he actually drafted. I truly believe that Matt Millen may well have been the worse front office executive to have ever held a general managers’ position in the NFL ! His decisions have bordered on being insane and led many believing that the Lions were in fact doomed for hell. Well it appears that not only having been snake bitten the Detroit Lions simply can’t get out of their own way no matter how hard they try ! Since being drafted by the team quarterback Matt Stafford has yet to play a complete season with the team. So much so , that one has to question the wisdom behind him being drafted number one overall in the 2009 NFL Draft . The $72 million contract of which $48 million was guaranteed money doesn’t now seem to be worthwhile, much less worth the lack of productivity and leadership skills shown by Stafford. The NFL in part as well as the owners ought to blamed for the absolute stupidity shown when it comes to the compensation of rookies entering the NFL. And even if now NFL Commissioner Roger Goodell and the owners are now pressing for that to be a part of a renewed and revamped collective bargaining agreement with the NFLPA . I can’t help but wonder what concessions that they’re prepared to make with DeMaurice Smith and his Executive Committee should this actually come into being. What might be now troubling other than the lack of productivity from Stafford is the team has a Pro Bowl caliber wide receiver in Calvin Johnson , running back Kevin Smith and Ndamukong Suh all of whom are being wasted on a team that struggles increasingly to stay in games and play competitively. The talents of Johnson , Smith and Suh I believe are simply being wasted because until this team actually has a quarterback that can play a full season without health concerns then there’s not much a real chance of the Detroit Lions being considered a legitimate contender within their division (NFC North) much less the rest of the NFL . Granted Johnson , Smith and Suh have proven to a blessing for the Lions but Ford Field has become an elephant’s graveyard but I simply think that the real failure of this team is the fact that Stafford can’t be trusted to lead with any kind of authority. The offensive line of this team still leaves a lot to be desired and the defense itself struggles to show any type of consistency throughout much of the season. Schwartz for his part knows that if the Detroit Lions are to viewed as a contender then this team will have to bolster its roster by way of free agency and through the upcoming NFL Draft . At this juncture it’s hard to really say in what direction the team will go as it looks to fortify its roster but it’s clear that the this team’s needs are many. On both sides of the ball the Lions need to obtain players that are able to contribute immediately rather than simply remaining an ongoing project. It’d be true to say that the long suffering Detroit Lions’ fans have had to endure a great deal over the last few seasons and it’s not as if they were under the impression that their fortunes were about to turn around. It took the abrupt departure of their Hall of Fame running back Barry Sanders for many to realize how far this team had fallen . There were outcries when Sanders walked away from the Lions , many felt he betrayed them and the organization but much of that came down to the fact that the running back clearly didn’t feel that the organization was doing enough improve the roster Marty Mohrninweg who at the time was the coach of the Lions while Millen’s tenure was in place diligently tried to coach this team to some semblance of success. And as we know the coach’s tenure wasn’t that great to begin with given his proclivity for the ridiculous and making many outrageous whilst coach of the team. If anything given the failure of the team and the fact that the Ford family as owners simply showed about as much interest in the team as they’d done with the family business and their failure there. Now one might opine that the Ford Motor Company is back as a profitable concern but given the fact that they’re more likely to drop the ball before reaching the endzone as given their recent history. But here’s something that you should consider the company though now profitable still remains a cause for concern as it is still leveraged to the hilt __________ the motor company in order to stave off financial ruin sought financing from a consortium of financial institutions . Fifty billion dollars ($50 billion [$50,000,000,000]) and Ford President & CEO Alan Mulally might just be considered to be a hero within the company but I seriously doubt that the same can be said about William Clay Ford Jr and his tenure as owner of the Detroit Lions ! I’d like to think that Ford and the executives of the Lions are completely focused getting the Detroit Lions back to being a competitive and legitimate contender within the NFL but given their form as of late I’m not so sure that they’re capable of actually doing that ! The Detroit Lions’ history over the years isn’t one that’s filled with a great deal of historical highlights and at the same time in terms of the Superbowl’s history they’ve yet to make that their stomping ground. I’d like to say that I can envisage seeing that as part of their immediate future but in reality that’s something that’s not about to happen anytime soon . The NFC North with the Green Bay Packers , Minnesota Vikings and Chicago Bears along with the Lions has been a division that has become a three horse race in recent years . And within the division the Lions haven’t yet been able to even show that they’re even the equal of the participants there . It’s going to be a long time coming if they’re to prove their worth within the division much less the rest of the league . The future of the Detroit Lions could very well hold a great deal of expectations for the organization but much of that will be predicated upon not only the coaching staff , players but primarily the mindset of the ownership and the zeal with which they appear to want success and until that’s clearly defined , then we’re liable to see the same continued failures we’ve become accustomed to. What thoughts if any do you have on the Detroit Lions and what changes if any do you see them having to make in order to get better ? Simply chime in with your thoughts on the matter and any other pertinent issue concerning the NFL . (1) Then GM Matt Millen introduces Marty Mohrninweg to the the convened press at Ford Field in Detroit as the team’s new coach. His tenure came to be known as the “wonder years” as everyone simply wondered where the team’s next w in would be coming from . Deroit Free Press /Craig Sergeant ……………. (2) Barry Sanders (20) seen here in full flight in a game against the Chicago Bears . Inset is Bears’ defender Mike Singletary (50) giving chase to Sanders . AFP/ Chris Chandler …………..
(7) Perhaps the greatest player ever in Detroit Lions’ history Barry Sanders is seen here with former NFL player Daryl Hobbs as they’re about to compete in DIRECT Tv’s fifth annual Celebrity Beach Bowl in Victory Park , Dallas , Tx in February over the festivities covering Superbowl (SBXLV) weekend. Getty Images North America / Michael Buckner ……. A lil’ more of Ms Bax . Just the way I like it ! Something to rev up one’s engine ….. more of Christine . The Tampa Bay Buccaneers Are Bucking A Trend ………..
Week 17 and to my mind the achievements of the Tampa Bay Buccaneers and the team’s coaching staff cannot be overlooked or underestimated this season. Coach Raheem Morris in just his second season as a head coach in the NFL has the team playing with a great deal of resolve and much to the amazement of the fans who convene at Raymond James Stadium Tampa , Florida this season to watch a spirited Bucs’ team play. What many thought to be would take at least three years in its creation, in turning around this team in one year by prudent coaching but with even more astute assessment of the talent necessary in making this team better. Raheem Morris and GM Mark Dominik have made the Buccaneers and the entire organization the envy of the league. And in spite of this all , consider this , the Buccaneers have the youngest team in the NFL in terms of average age and are the first team in league history to start an NFL game with twelve rookies on its roster . And while there have been growing pains while the Buccaneers learn how to be competitive what might be even more surprising has been the maturation of quarterback Josh Freeman who could very well be on his way to earning a Pro Bowl berth for the NFC as a player in the Pro Bowl. Along the way the player has had a stellar season and led his team with a great deal of authority. Aiding Freeman in all of this has been a slew of young draftees that could be destined for greatness should their learning curve remain consistent and improve as Dominik and Morris would no doubt expect. This year’s top draft pick taken by the Buccaneers was DT Gerald McCoy taken in the first round , third overall out of the University of Texas and the coaching staff would make sure to supplement the current roster with integral pieces that would be of benefit to the team . And amongst this all has been an unsung hero LeGarrette Blount the undrafted rookie free agent who has has now become the catalyst for this Buccaneers’ offense and who essentially the running back starter’s position his own. Not to be left out of the conversation has to be the contributions made this season by other draftees Cody Grimm , Arrelious Benn and Mike Williams who’ve made the jump with a great deal of self assuredness. And while many might choose to say that it’s far too early to say how good this Bucs’ team can become all the signs seem to state that they’re indeed heading in the right During Jon Gruden’s tenure as coach I can’t remember him ever having this much success with any player that he drafted over the course of his reign. As a matter of fact as a coach when it came to nurturing talent especially amongst rookies, Gruden’s methods left a great deal to be desired. And I think that it’s pretty safe to suggest that assessing talent and nurturing it was never ever one of Jon Gruden’s greatest strengths. But he’ll be forever thought of as the coach who came into Tampa and brought the city a Superbowl (SB XXXVII). Since those lofty years up until his abrupt firing his record with the team had been spotty at best. 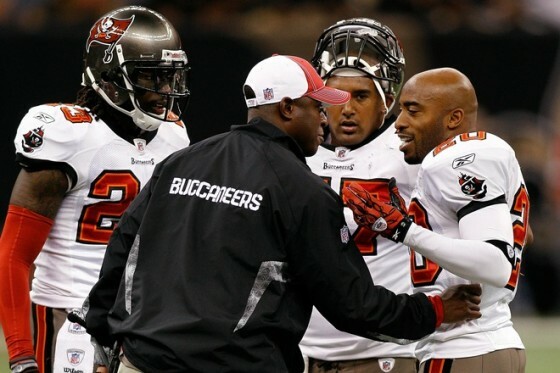 Head coach Raheem Morris talks with Ronde Barber (20) of the Tampa Bay Buccaneers during the game against the New Orleans Saints at the Louisiana Superdome on January 2, 2011 in New Orleans, Louisiana. The Buccaneers defeated the Saints 23-13. Photo by Chris Graythen/Getty Images ……. Succeeding Gruden , Raheem Morris wasn’t thought of as the obvious choice but given the financial frugality being shown by the Glazer family and their propensity for not wanting overspend on anything, it went without saying that the hiring of a rookie coach was the option that they felt was best for the organization. PR nightmare or not team owner Malclom Glazier could only have held out for a modicum of hope that there would be any dividends to be reaped from this hiring . Going 3-13 in his first full season with the Tampa Bay Buccaneers , Morris had the fans , local beat writers, sports columnists seething with rage and baying for his blood. Not content with that the fallout would have its financial reverberations within the community as there was an immediate decline in the attendance for games at the stadium. It has impacted the team’s support this season and with all but one the team’s scheduled home games being blacked for coverage within the local market. And while things might appear to be now looking on the up for the organization much of that will be predicated upon the continued success of this team under its coach. Now riding on the crest of a wave the team now faces their sternest test of the season as they face the reigning Superbowl champions the New Orleans Saints in a game that will have playoff implications for the Buccaneers . A win and a loss by either the Green Bay Packers and New York Giants and the Buccaneers would be assured of a playoff berth. A loss and they’d have to make do with something of an eventful but yet unexpected season that has been filled with highs and lows . With all that the Buccaneers’ fans have had to endure this season and the spirited effort that has been shown by this team it augurs well for next year. And even if they should fail to make the postseason which on appearance would now appear to be a certainty one can’t help but wonder what might have been had one or two of the earlier results during the season had gone their way. Many of those downfalls fell to the overall lack of experience shown by the team and coaching staff but as the saying goes ……….. what doesn’t hurt will make you stronger . And for the Buccaneers this has been a season fraught with dangers but at the same time it has also been filled with the angst of watching a group of players learn to how to player together and be moulded into a team. And that will indeed be of benefit not only to the Buccaneers’ organization but also the fans. Whatever their frailties have been , be it on the defensive or offensive side of the ball Morris’ players have learned from it and the improvements are now being seen. As I alluded to earlier, it will augur well for their immediate future. And for players such as Josh Freeman , Mike Williams , Arrelious Benn , Kellen Winslow , Cody Grimm and Davin Joseph their time will come and they will no doubt challenge the likes of the Atlanta Falcons and New Orleans Saints within the NFC South for divisional supremacy as well as the rest of the NFL . Their continued progress it’s hoped will quite possibly lead to a Superbowl appearance and victory . How sweet would that be given the travails of this organization over the last few years ? What thoughts if any do you have on the success attained by the Tampa Bay Buccaneers this season ? And what if any has been a major surprise to you in terms of the NFL as we now head into the postseason . Simply chime in with a comment. With all that the Bucanneers' fans have had to endure this season and the spirited effort that has been shown by this team it augurs well for next year. And even if they should fail to make the postseason which on appearance would now appear to be a certainty one can't help but wonder what might have been had one or two of the earlier results during the season had gone their way. Many of those downfals fell to the overall lack of experience shown by the team and coaching staff but as the saying goes ……….. what doesn’t hurt will make you stronger . And for the Buccaneers this has been a season fraught with dangers but at the same time it has also been filled with the angst of watching a group of players learn to how to player together and be moulded into a team. And that will indeed be of benefit not only to the Buccaneers’ organization but also the fans. Whatever their frailties have been , be it on the defensive or offensive side of the ball Morris’ players have learned from it and the improvements are now being seen. As I alluded to earlier, it will augur well for their immediate future. And for players such as Josh Freeman , Mike Williams , Arrelious Benn , Kellen Winslow, Cody Grimm and Davin Joseph their time will come and they will no doubt challenge the likes of the Atlanta Falcons , and New Orleans Saints within the NFC South for divisional supremacy as well as the rest of the NFL . Their continued progression it’s hoped will quite possibly lead to a Superbowl appearance and victory . How sweet would that be given the travails of this organization over the last few years ? New Orleans Saints running back Chris Ivory (29) is stopped on a rushing play in the first quarter of an NFL football game against the Tampa Bay Buccaneers at the Louisiana Superdome in New Orleans, Sunday, Jan. 2, 2011. The Saints lost 23-13 . AP Photo/Gerald Herbert …..
Tampa Bay Buccaneers running back LeGarrette Blount (27) fumbles the ball on a hit by New Orleans Saints defensive end Alex Brown (96) during the fourth quarter of an NFL football game at the Louisiana Superdome in New Orleans, Sunday, Jan. 2, 2011. The Saints lost 23-13. AP Photo/Gerald Herbert …..
Head coach Raheem Morris celebrates with Elbert Mack (33) of the Tampa Bay Buccaneers after defeating the New Orleans Saints 23-13 at the Louisiana Superdome on January 2, 2011 in New Orleans, Louisiana. Photo by Chris Graythen/Getty Images …..
Quarterback Josh Freeman (5) of the Tampa Bay Buccaneers is pushed out of bounds by Alex Brown (96) of the New Orleans Saints at the Louisiana Superdome on January 2, 2011 in New Orleans, Louisiana. The Buccaneers defeated the Saints 23-13. Photo by Chris Graythen/Getty Images ……..
Quarterback Josh Freeman (5) celebrates after throwing a touchdown with Dezmon Briscoe (89) of the Tampa Bay Buccaneers during the game against the New Orleans Saints at the Louisiana Superdome on January 2, 2011 in New Orleans, Louisiana. The Buccaneers defeated the Saints 23-13. Photo by Chris Graythen/Getty Images ………..
NB By clicking on the links provided below you can obtain the latest concerning the NFL . Eye candy Ice T’s main squeeze Nicole ‘Coco’ Austin. Anne and Kate , somehow I wouldn’t mind being the meat in between those two layers of a sandwich !